Have you fallen into the idea that only people who shop for new or used trucks for sale in the Albany area are people who go off-road on a daily or several-times-weekly basis? The truth is that your truck-owning friends, neighbors, and colleagues might have a multitude of reasons for adding a truck to their personal fleet of vehicles. Without a doubt, New Yorkers — and Americans in general — love their Chevy trucks. However, truck owners aren’t created from the same cookie cutter mold. In fact, men, women, and teens all purchase new and pre-owned trucks for very personal reasons. If you’ve never owned a truck before, we invite you to drop by DePaula Chevrolet for a test drive. Then, consider the many ways that buying trucks for sale could make sense for your lifestyle and family situation. Why do so many individuals on your block proudly have trucks in their garages and driveways? Chances are strong that they’re investing in a truck for at least one of these reasons. They are tired of being limited when shopping for larger items. Have you ever had the experience of being in a store and not buying something solely because it wouldn’t fit in your car? Immediately, you ask yourself, “Who do I know with a truck?” If you don’t have someone in mind, you’re out of luck unless you want to rent one or pay for a stranger to bring your merchandise home. Having a truck of your own makes it easier to haul items back and forth as you need. Never worry again about not being able to grab a deeply discounted sofa at a bargain outlet store, or missing out on serious appliance savings because you had no way of getting your drastically reduced upright freezer home. Love antiquing in New York state and the rest of New England? You’ll appreciate it even more if you have a truck to take with you. Bid like a pro, and always take home your favorite vintage pieces — even if they’re huge. They want the safety of having a truck for tough winters. In the northeast, winters can be rough. Several inches of snow can be hard and unsafe to navigate, even in great Chevy cars. When you have a truck at your side, you can more easily get to work, to the store, or even to help friends and family dig themselves out after a massive snowstorm. Even if your community doesn’t get walloped by several feet of snow over the winter, it can still fall victim to severe flooding. 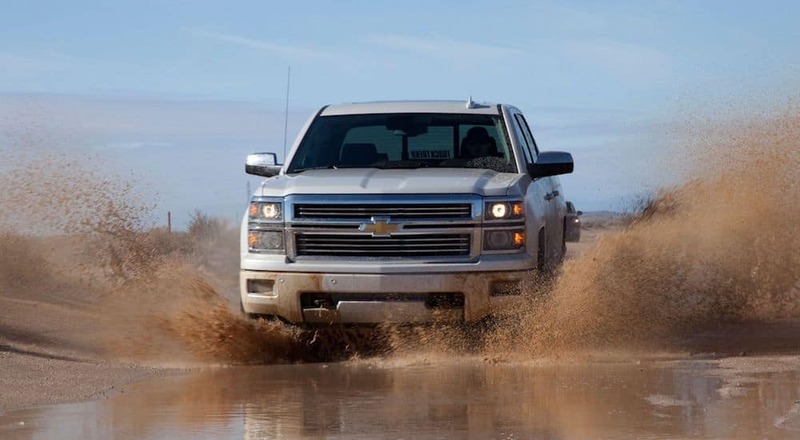 Again, while you shouldn’t drive a truck through deep flood waters, a truck can definitely go through puddles more conveniently and efficiently than an automobile or motorcycle. Besides, who doesn’t love the idea of occasionally taking a ride up into the forests and wildernesses not far away from the Albany scene? A truck can take you high into the mountains without getting stuck in the muddy foothills. You’ve finally decided that it’s time to get a boat to take on the lake. It’s a great investment, but you’ll need a strong, powerful vehicle to get the boat to its watery destination. That’s where the best Chevy trucks come into play. Whether you get a new or used truck, be sure it has the capacity you need to tow your equipment. That way, you can be certain that you always have a reliable ride to get your “toys” (e.g., motorboats, canoes, kayaks, ATVs) from point A to point B with ease. You feel too constrained in modern vehicles. Having a car is a wonderful thing, but having a truck can seem like a luxury. Fortunately, it’s an affordable one, too! Cars tend to have smaller interiors than trucks because of their general nature. If you’re a larger person, you may even feel like you’re constrained or cramped in a typical sedan. Having a truck helps you stretch out a little bit and perhaps even enjoy your daily road trips to the office a little more. At the same time, you could also benefit from having a different vantage point. Trucks ride higher than automobiles, and some drivers simply prefer the feeling of being able to see over the tops of most other vehicles on the road. You want to take your fitness to an adventurous level. Have you been saying for years that you wanted to get more into adventure racing, like trail running, competing in “Tough Mudders”, mountain climbing, or cross-country skiing? It’s unlikely that you’ll be able to get into the hinterlands with your car. But a truck can transport you to new places that will re-invigorate your physical training. Is your wellness important to you? Are you aching for a healthier lifestyle? A Chevy truck could be the impetus to get you off the couch and exploring parts of the Albany and surrounding areas you never knew existed! You want to take more stuff on family vacations. Do you loathe leaving your mountain bikes and other items behind every time you take a road trip? Chances are good that your kids do, too. Turn every vacation more fun by packing the bed of a truck with all the equipment you really need to turn your holiday outings from so-so to stellar. Sound interesting? Your next move should be to visit our showroom at DePaula Chevrolet and see which trucks appeal to you. Chevy trucks come in a variety of shapes, sizes, trims, colors, and models. You’ll never know the perfect fit until you test one out on the road. Been thinking about an SUV but don’t like the shape or price? A Chevy truck could be a better option for fuel efficiency and roominess. Again, the only way to make a decision is to slide behind the wheel.